The language of Maths has always been such a huge barrier to learning for kids in my Maths groups. We’ve tried countless ways to build confidence around the 50+ different words for the the four main mathematical operations (add, subtract, multiply and divide). When taking on subtraction – for example – vocabulary played a huge part in our learning journey (see https://www.youtube.com/watch?v=eTIy5eSgiuI for the music video). We call them ‘Secret Words'; those terms so often used to trick out unsuspecting kids on tests created to assess their understanding – a ridiculous affair! Over the last few years, I think we’ve nailed it – or at least we’re feeling good about ourselves. I have no idea what to call them (answers on a postcard!? 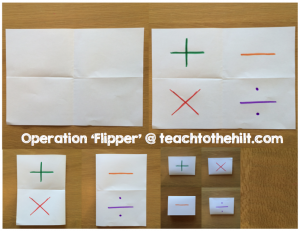 ); they’re simple to make, easy to use and work great as a mental/oral starter or warm-up to any maths lesson. The concept essentially sees each child sat in their seat with their own ‘Flipper’ – a piece of A4 paper folding into quarters. On each quarter (or cell) they write/draw each of the four major maths operations (+, – , x , ÷) and make as many folds along the lines until they feel comfortable manipulating their flipper, to show any of the four signs. You could always simply re-write symbols on whiteboards, but the flippers are much more fun and instant. I’ve worked with these for ages and have normally just shouted out a ‘secret word’ that the kids then match to the correct symbol on their flipper. They simply fold the correct operation into place and hold it up for me to assess their understanding. Due to its success, I’ve adapted the warm-up to use the spinner below. It includes ‘secret words’ from all four operations and (should!) make the activity more engaging and interactive, as well as making it even easier to deliver. I was thinking about making a flipper available for download but part of the process is to engage the kids by getting them to create their own. So get spinning and flipping to help your maths group to finally crack those sneaky ‘secret words’ – good luck!